All the way from across the pond, welcome Sarah of Modern Country Style. Her blog chronicles the renovations of the charming Edwardian home she shares with her family in the Cotwalds (as well as crafting and fashion thrown into the mix). Take a look at what she did to bring style back into her kitchen. Stefanie's blog was my very first blog crush I can't tell you how honoured I am to guest post here. I'm Sarah from Modern Country Style. I live with my husband and four children in a little market town nestled in Cotswolds. Modern Country Style is all about taking the very best of traditional country's warmth and comfort, and combining with a muted, pared-back Modern look. Want to know what I mean? Where better to demonstrate that than in the heart of the home: the kitchen? Here's the hideous before from when we looked round. It was like being in a giant egg yolk. Harsh but fair. When we first viewed our house, the kitchen was one of the rooms that I knew would be high on our priority list to change. I thought I hated everything about it until I realised that underneath the lurid colours and dated decor was actually quite a nice kitchen, waiting to be unearthed. 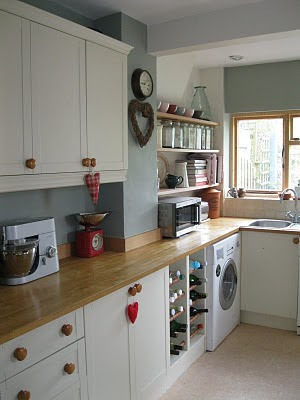 We decided to keep the beech wood worktops and the cream Shaker units but everything else HAD TO GO. I was astonished how lovely the worktops looked once we'd finished. They changed dramatically from reflecting the walls in a very orange way to having a lovely mellow golden warmth. We've used Farrow and Ball Blue Grey and Farrow and Ball White Tie on the walls. Have you used Farrow and Ball paints? To. Die. For. Yes, they're more expensive but the colours are worth every last penny. I love simple blocks of muted colours, highlighted by the crisp, sharp contrast of white glossy woodwork. We had the boiler moved upstairs, which created a space that was just perfect for a bit of open shelf action. We don't have a table and chairs in our kitchen, so, in the dining room next door, I've used a paler version of the Blue Gray to bring unity to the two spaces. I can never get enough of the Modern Country look and its delicious yet delicate use of winter seascape colours. If this is a look you love too, then swing by my blog to have a good snoop around. Thank you for having me, Stefanie. The full kitchen photo was one of her inspiration pics, not actually her kitchen. However, I love how her real kitchen turned out! That full kitchen shot confused me because it wasn't matching any of the other photos. I have to say that I found the real "After" photos very unclear, close ups do not show us how the room actually looks. get out of town. that is NOT the same kitchen. i looooove it!!!!!! Thanks Anon. I tried to edit this post on the road and I must have fowled up somewhere. I've removed that photo. Sorry about the confusion. I remember seeing her kitchen and being amazed at the transformation. Love all of the special touches that give her kitchen such charm!! Thanks so much Kathy! I'll be posting about the awesomeness that is House of Fifty later this week. It looks amazing - would love to cook in that kitchen - functional and pretty..great color choices! Agree the afters look great but it's difficult to know what the whole thing looks like with so many closeups. Would have been nice to see it shot from the same angle as the before picture. Maybe less art-y shots and more wide angle ones please?